On the occasion of the New Year 2019, His Holiness Patriarch Mor Ignatius Aphrem II invited their Excellencies the Ambassadors, Charge d’Affaires and Diplomatic Representatives to a Formal Reception at the Patriarchate in Bab Touma. 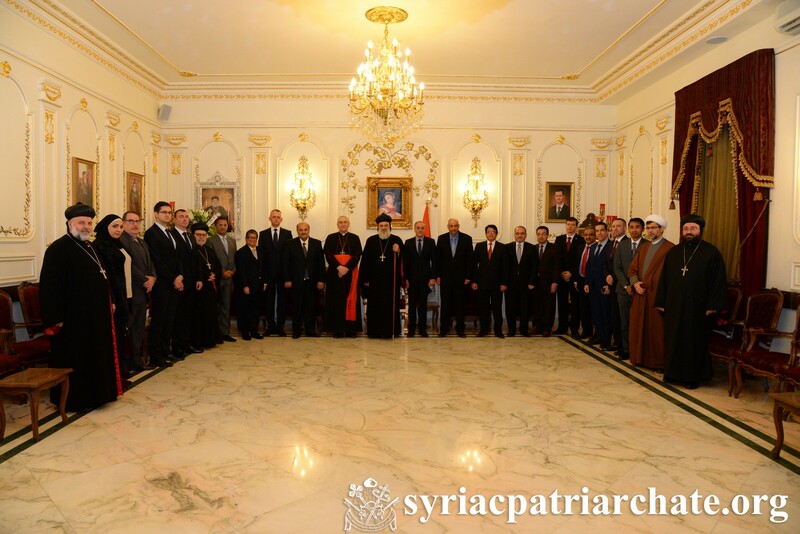 The reception was attended by His Excellency Mario Cardinal Zenari, Apostolic Nuncio in Damascus, His Excellency Dr. Ayman Sousan, Syrian Assistant Foreign and Expatriates Minister, as well as the ambassadors or heads of missions of various countries. His Holiness Patriarch Aphrem II welcomed their Excellencies and spoke about the positive turning points in the general situation in Syria, especially the victories over terrorism. He considered that the Syrian people have suffered a lot, where in fact no human being should ever suffer. He also remarked that the rebuilding of Syria happens through the cooperation of all; he said, the Church has the responsibility to spiritually build the people. His Holiness added that the Syriac Orthodox Church has started this process by opening Antioch Syrian University to emphasize the importance of education in promoting peace and developed society. He also thanked the ambassadors and their respective governments for their solidarity with Syria, especially expressed by the presence of diplomatic representation and cooperation in Syria. His Excellency Dr. Sousan then assured that Syria appreciates the presence of the diplomatic missions in Syria, for they give the Syrian people a great support; in addition, they are witnesses to the love for life that the Syrians have. His Excellency Cardinal Zenari gave then a speech in which he noted the positive presence of the diplomats in Syria, especially the newly reopened embassies. He considered that this is a good sign that the country is recovering. Their Excellencies then expressed their joy to be united at the Syriac Orthodox Patriarchate and they felt this reception to truly reflect the image of the Syriac Orthodox Church and the Syrian hospitality. Their Eminences Mor Timotheos Matta Al-Khoury, Patriarchal Vicar in the Patriarchal Archdiocese of Damascus, Mor Dionysius Jean Kawak, Patriarchal Vicar for the Archdiocese of the Eastern United States of America, and Mor Maurice Amsih, Archbishop of Jazeera and Euphrates, also attended the reception.